2013 mid-term election is happening few days from now. Have you decided who you’re going to vote already? Well, if you are going to ask me that same question now, I have no ready answer because my list of chosen candidates is not yet complete as of this writing. Voting is one of our rights as Filipino citizens and I am encouraging everyone to exercise your right, think and pick very carefully. Do not trade your votes for meager amount of money or goods. Clerk asks which party you want before scanning the barcode. Customer pays for his/her gulp. If you are too busy and can’t spare some time to go to 7-Eleven, you may also participate in this campaign by visiting this site: http://7-election.com.ph/. You may use your Facebook or Twitter account to sign up and vote. You can also monitor the standing of the candidates through that site and/or share them on your social accounts. There is also a gallery in the said site and you may upload your photo during your participation in the campaign. Now, here's a little background about 7-Election: Last 2010 during the Presidential election, 7-Eleven was able to predict the actual presidential winner! The said campaign garnered multiple awards both in the digital and advertising industries. Well done, 7-Eleven! Remember, this is a promotional and fun campaign of 7-Eleven only and it would not, in any way, affect the results of the real election. Vote wisely on May 13th! Love this stuff they have. Aside from making a bit of survey, this is a good marketing strategy huh. I wonder how they rank the candidates since they only ask for the party you want, do they also ask who your preferred candidate is? Ang cute and creative naman ng may idea nyan... well, the election is done. I hope we have the right leaders now. That's a nice promotional campaign by 7/11. I also remember before when they gave up free drinks (Coke) to the first x number of customers. That really went viral. I saw the final count of the gulp elections and I liked their results better that the actual election results. Why did I missed this one when there are many 7-11 outlets near here? This is a great marketing campaign for 7-11. It also provide an alternative for mainstream election surveys. What a nice idea for marketing campaign. Hope 7/11 will have a branch here in Davao. Too bad my bet didn't win. Only 7-11 won from me. For sure this campaign/ad went well. Good for the store and for the election survey as well. It's amazing to know 7-11 doing an extra service to the country. 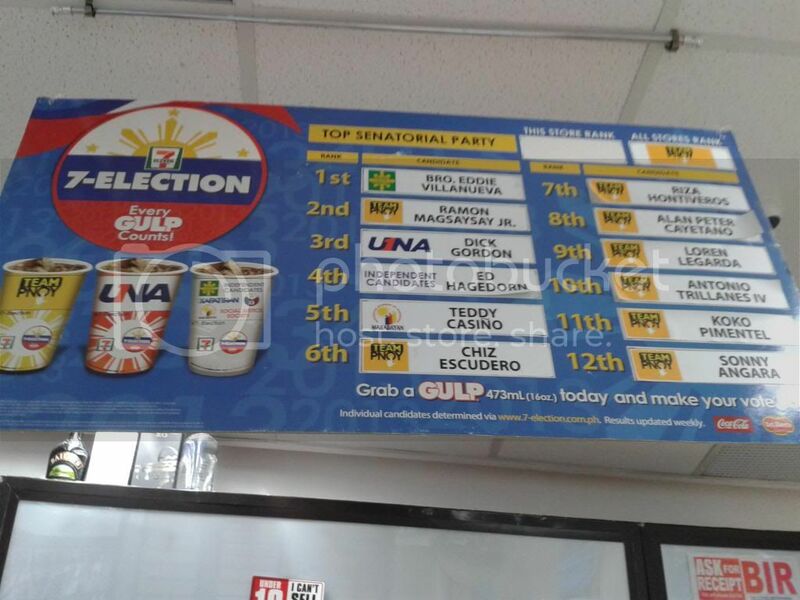 Their customers are doing great with this 7-Election Gulp. Kudos to 7-11!